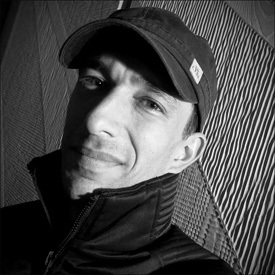 Benoît Averly lives and works in Burgundy, France. Born in 1980, Benoît made several trips to Europe and the USA to further his training as a woodturner. Since becoming a professional woodturner in 2003, Benoît has received several prestigious awards in the field of woodturning and continues to share his expertise in demonstrations around the world. Throughout the years, Benoît’s love for wood and design extended to sculpture. Self-taught and naturally gifted, Benoît creates minimalist style pieces of work with strong contrasts, playing with light, lines and textures. The rigor and sensitivity of his shapes are in harmony with the nobility of a living material. The superb craftsmanship and contemporary spirit of his work has resulted in his pieces being sought after by collectors and interior designers around the world. We will start off the day with a short slide presentation. It will explain the evolution of my work from the beginning all the way to my current work. The presentation will discuss how I find inspiration for my work and the way that my work has evolved as a result. For this project we will cover the process of box making. This will the elements of proper design and how to utilize them to create well balanced pieces that are pleasing. We will also incorporate decorative texturing on the Hut Box. I will introduce students to the skew chisels I use and how they are used. We will spend some time on practicing skew chisel techniques. We will focus on tool techniques and sharpening throughout the week so that students become proficient with both before the end of class. Bowls are an excellent project for practicing shapes. As we complete the bowl, we will proceed to decorate them. We’ll cover several different ways of decorating and texturing using turning tools as well as power tools. As we work on the bowl project, we will continually focus on proper turning tool techniques and sharpening including types of grind and tool profile to suit the work at hand. We will also begin texturing by way of turning tools and power tools. This is a mix of both previous days. Techniques used to create the Hut Box as well as our bowl project will be incorporated into the flat box. The idea is to hollow an enclosed cross grain form with a bowl gouge and to decorate the outside. Proper tool technique, turning cross grain and decorative techniques used to create patterns, textures and more. The last part of the day will be a slide presentation about patterns, textures, proportions, using photography as a source of inspiration. The work of the day will be on flat square or round surfaces (boards), creating small wall pieces. This is a good way to play with textures and discover more about different dyes and paints. Creating various types of textures as well as using dyes, paints. During the final day of class, students will be free to choose a project of their own design that will allow them to use the techniques taught in the previous days. I and the assistant will assist students as needed and provide inspiration to those needing a bit of help with their choice of project.